Moyo is a small island located off the northern coast of Sumbawa, west Nusa Tenggara and is inhabited by about 6,000 people, it offers spectacular coral and crystal clear waters for good diving possibilities. However the island's reefs do suffer from the effects of dynamite fishing and corrupt village chiefs who often collect bribes from liveaboard operators for what they claim is "conservation". On the west coast of Moyo lies a healthy coral reef with a vertical wall dropping to over 40 meters in depth. The wall is covered in soft coral however evidence of dynamite fishing can be seen in places. Marine life includes longfin bannerfish, redtooth triggerfish and batfish. Blacktips may also be seen in the deeper sections of this dive. Located just north of Angel Reef is this submerged coral reef. 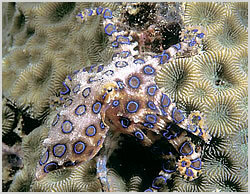 This is one of the few places that a patient and observant diver may spot the deadly yellow blue ringed octopus. Fully grown adults reach the size of half of your thumb, and carry one of the most toxic poisons to be found in the sea so don't touch it! There are a number of other submerged reefs around the island. Getting there : Boat 45 minutes.